The MacLean Funeral Home Swan Chapel, locally owned and operated by Allison and Gail Swan, has served the Island community for over three-quarters of a century. We are proud to be active, contributing members of our society and have supported numerous organizations including the Queen Elizabeth Hospital and the University of Prince Edward Island. We take pride in being involved in our faith communities, Rotary International, Free Masons and other community based activities. 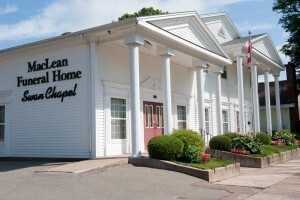 MacLean Funeral Home Swan Chapel is a proud member of the PEI Funeral Directors and Embalmers Association, Funeral Service Association of Canada, National Funeral Directors Association, Canadian Independent Group of Funeral Homes and the Greater Charlottetown Area Chamber of Commerce.